When the campaign ‘Le t’s choose what we watch’ was launched the Agency for Electronic Media and UNICEF in Croatia believed that raising awareness on the importance of media literacy coupled with the introduction of new regulations would help to protect children and contribute to a better quality of joint monitoring of media content. 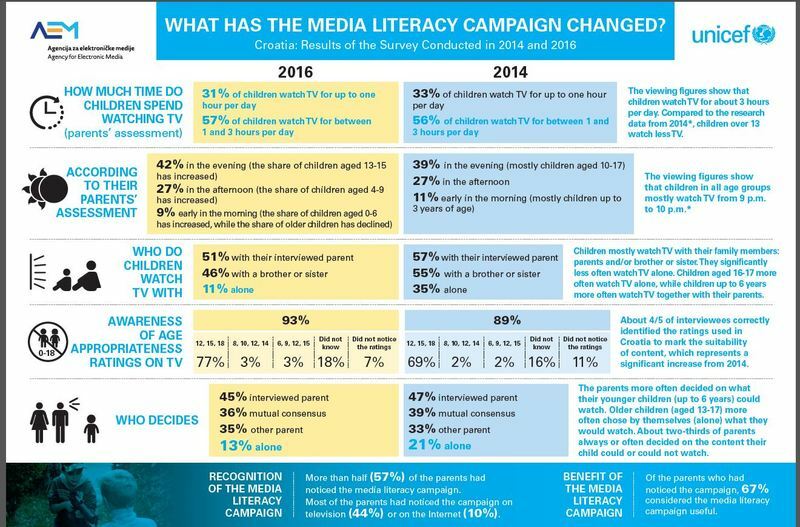 A survey into the television viewing habits of children in Croatia, which was repeated in November 2016, following the implementation of a media literacy campaign, indicates changes in the way children and parents watch television. The majority of children watched TV programmes together with their family, while only 11 % spent time alone in front of the TV screen. Two years ago, one in three children watched TV programmes without adult supervision. Almost all parents, namely 93%, recognised the age ratings signs that indicate the suitability of TV content and knew what they mean for children. Parents considered the appropriateness of the content to be the most important factor when making a decision on what their child can watch; 67% of parents found the media literacy campaign useful. The goal of this campaign from its inception has been to raise awareness about the importance of media literacy amongst parents, caregivers and children and to highlight the importance of choosing appropriate content for children. According to the parents' assessment, 57 per cent of children spend between one and three hours per day watching TV. This equates to more than the time they spend playing with their friends or studying. Although the parents stated that their youngest children spend the most time in front of the TV screen in the morning and older children in the evening, the viewing figures show that all children watch TV in the evening between 9 and 10 p.m. Watching TV is in decline among children over thirteen yet watching TV content on smartphones is on the rise, even for the age group four to six. Education and raising the level of media literacy are the best ways to protect children from potentially harmful media content according to the AEM. The online portal medijskapismenost.hr and the recently presented Recommendations for the Protection of Children and the Safe use of Electronic Media, prepared by the Agency for Electronic Media, are likely to contribute to further increase media literacy.